Proprietary Reporting Engine, advanced analytics, and joint back office arrangements. Avatar has a dedicated in-house back office that reconciles trades from each execution platform on a nightly basis to ensure all traders have accurate and accessible trade information at all times. Coupled with our proprietary reporting engine, advanced analytics, and joint back office arrangement, Avatar is able to offer best of breed support and post-trade analytics to all our trading members. The Trading Portal was built in house with the concept of providing transparency and redundancy for all executions and fees. Trading members are able to access all information on a T+1 basis and deploy customizable searches for analytics. In addition, Avatar allows traders to utilize it’s transaction cost analytics tool to take advantage of a more granular view of their trading behavior. Avatar’s trade desk routinely secures the necessary shares for each member that carries an overnight book. We have access to most major lending databases, multiple custodians of share inventory, and morning processes to efficiently manage and minimize the number of and impact of 204 buy-ins. 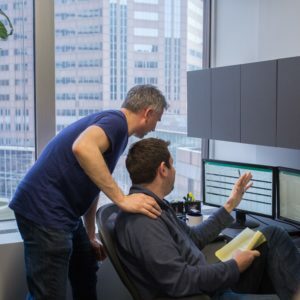 Avatar, in addition to its JBO relationship with Wedbush Securities, has a direct partnership with numerous unique vendors for locates and pre-borrows. Trading members are able to quickly and directly secure hard-to-borrow shares in accordance with SEC Rule 15c3-5, providing trading opportunities not typically available in a retail environment. As a registered U.S. equities broker-dealer, Avatar is able to participate in joint back office (JBO) arrangements with larger clearing firms. Avatar is able to leverage these relationships to provide a seamless experience for our traders. Our network is professionally engineered and maintained using top-of-the-line firewalls, routers, and switches. Avatar has a highly experienced and dedicated network and systems engineering team to monitor and maintain all connections at our primary locations. We offer redundant fiber connections and equipment at our on-site locations to ensure maximum uptime. In addition, we have servers located in Equinix’s NY4 Data Center. Here at Avatar, we look to attract and retain the brightest talent in the industry. For those interested in trading at either of our New York or Chicago trading floors or remotely, learn more. Avatar has direct market access and routing relationships with nearly every major vendor for domestic equities. Our back office and connectivity team is continuously improving the quality and quantity of destinations available for traders, allowing them to be nimble and competitive in today’s dynamic execution environment. Our wide variety of direct market access, dark pool aggregators, and intelligent routers allow traders to participate in the venues with the highest liquidity at the most competitive cost structures. We understand every trader’s needs are different. Contact us to get specific information, Contact. Avatar is a proprietary broker dealer and does not carry customer accounts. However, we have unique relationships that combine high end execution tools with portfolio margin in the retail environment. Active retail traders introduced by Avatar can utilize a portfolio margin structure while clearing through Bank of America, ICBC and Wedbush Securities. For more information, please contact us.